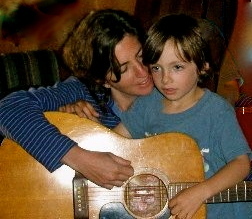 Joanna is passionate about music and the development of children. She creates a fun, informal, social setting that spurs engagement and supports each child's musical development. Joanna studied voice, theater and literature at Indiana University and received a Vermont teaching license and Master's degree in Integrating the Arts into Education from St. Michael's College. 2018-19 marks Joanna's 7th year as a center director/teacher of Music Together®. Joanna teaches preschool music classes at The Schoolhouse, and Heartworks Burlington, Essex, Williston & Shelburne schools, as well as family classes in Richmond and Burlington. This past year she began teaching Rhythm Kids, a multicultural drumming program for Pre-K--2nd grade (so much fun!) and has been trying to improve her drumming chops with Sambatucada and KlezKanada in the summers. Joanna has also been singing/facilitating with the VNA's Noyana Singers for 11 years, bringing music to community members on hopsice and their families. Joanna is the mom of 2 music-loving teenagers (ages 13 & 15). Joanna's best musical influences were her parents, whose love of music made for a lot of singin' in the car!